Writing an article on one of the most holy cities in the world is bound to ruffle some feathers. They say to never discuss religion or politics at a party, but I must admit that I never followed that rule and have often been involved in heated arguments because of it. So why should I stop now. My intent is not to offend anyone. I just want to share my thoughts and feelings (and photos) after visiting Jerusalem. The city of Jerusalem is considered holy to the 3 main Abrahamic religions – Judaism, Christianity, and Islam. Since first being settled in the 4th century BC, Jerusalem has been destroyed twice, besieged 23 times, attacked 52 times, and captured and recaptured 44 times. 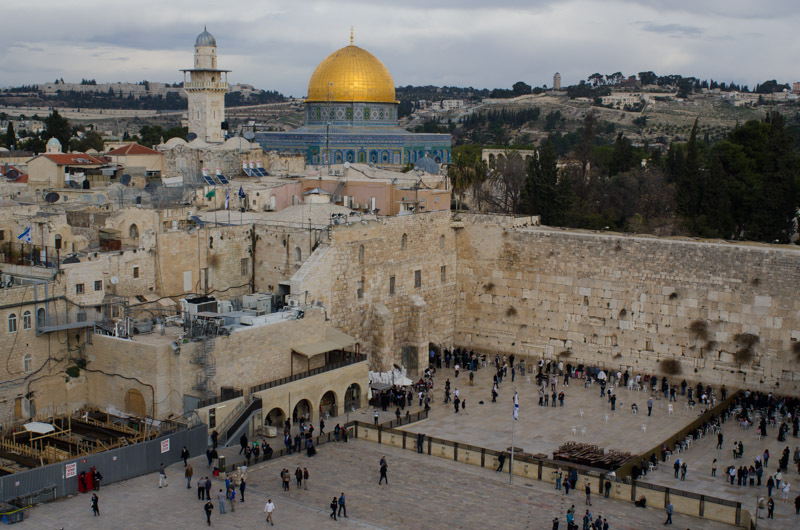 Israel claims Jerusalem as it’s undivided capital, but the international community disagrees. The international community does not recognize Jerusalem as Israel’s capital and considers Israel’s annexation of East Jerusalem from Palestine illegal. These are not my opinions. These are the facts. With so much conflict in Jerusalem’s history I wondered what the fuss was all about. My wife and I went back and forth about whether we should visit or not. World travelers fear Israel. They don’t fear for their safety, they fear the immigration stamp. Several countries will deny entry to anyone who has visited Israel and this can be a problem. I mean, how can you see the Great Pyramids of Giza if Egypt won’t let you in just because you visited Israel first? But Israel now issues entry and exit stamps on a separate piece of paper hiding all evidence of your visit. Problem solved! We landed at Ben Gurion International Airport in Tel Aviv and dreaded having to go through immigration. We had heard that Israeli immigration can be really intense and the immigration officers have been known to even pull innocent looking old ladies out of line and give them the third degree. We have also heard that they may even make you login into your social media accounts and read your posts, or to even confiscate your laptop. Gasp! But we were lucky and had no problems, nor saw anyone else having problems. The Israeli immigration officer asked us 3 times where we were staying and stamped us in. We have actually had more problems with immigration in England. Once we were stamped into Israel we exited the airport and caught a really expensive shared van to Jerusalem. Warning: You will be seeing the word ‘expensive’ a lot in this post! As our van drove down the highway I started to notice something that was a little different. 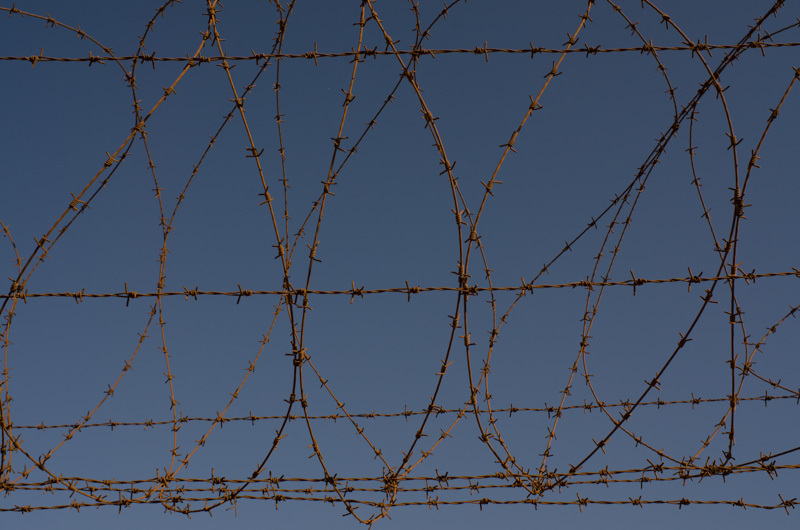 Barbwire, soldiers with guns, more barbwire, fences, and yet even more barbwire. I think the highest paid job in Israel must be the barbwire salesmen. I have never seen so much barbwire in my life. After passing though a few checkpoints with heavily armed soldiers the van started to drop off fellow passengers at their desired stops. The van drove through a quiet residential area and stopped in front of a large house and the driver told us this was our stop. As the driver unloaded our bags from the back of the van I looked up at the house and scratched my head in puzzlement. This did not look like a hotel to me. He replied, “No, it’s a house” and then proceeded to get back into the van and drive away. We stood there in the middle of the quiet residential street staring up at the house in front of us, wondering where the hell we were. Yes, it is a house. I can plainly see that. But why are we standing in front of a house and not a hotel? In looking at accommodation options for Jerusalem we were shocked at how expensive everything was. We looked at apartments and hotels and found them both equally expensive. 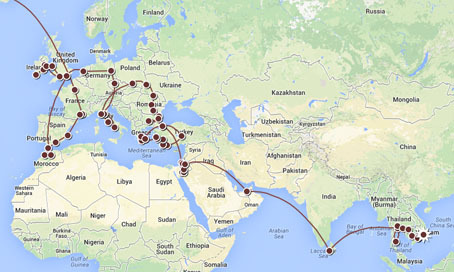 Most of them started at around $100 USD per night, which is our daily total travel budget. At the last minute we decided on a place with good reviews and offered breakfast for only $87 USD per night. For Jerusalem, that’s cheap! We approached the house and noticed an old, faded sign on the front that said “House 57” and knew we were at the right place. It was just strange to be in the middle of a residential neighborhood. But then again, with a name like House 57 it should have been obvious that it was a house. We carried our bags up the stairs and found the owner at the top waiting for us. He showed us our room in the basement of the converted house, which was nice but basic, and then showed us the communal kitchen where we could prepare meals. Bonus! One of the reasons we usually rent apartments is that having a kitchen saves us a lot of money compared to eating out for every meal. The owner said he had a large group of guests cancel at the last moment and drastically lowered the price to make up for it, so normally we would have paid a lot more to stay there. And we were thinking $87 a night was expensive! He also recommended a falafel place down the street where we could grab a cheap bite to eat. We headed there after unpacking our bags and were amazed at how good the falafel was. Even our daughter ate every bite! Afterwards we stopped by a supermarket to buy some groceries and were blown away by the prices. In our 17 months of world travel, mostly in Europe, we have never seen food prices as expensive as they are in Israel. Wow! We had come to the Jaffa Gate for the free tour that meets there daily. As we have traveled we have found free tours in most touristy cities and have really enjoyed them. Not only does it help you get your bearings, but we also find it very educational. We noticed a Tourist Information (TI) office and decided to step inside to get the free map and some information on what to do and see in Jerusalem. One of the people staying at our guesthouse had mentioned an art gallery called Museum on the Seam. It housed contemporary art dealing with the socio-political tension in Israel and thought we might find it interesting. We asked the lady at the TI office about the museum and she stated that she wouldn’t go there as it has a left point of view. This was shocking to hear coming from an employee of a TI office and my wife and I looked at each with raised eyebrows. Being a little confused as to what her definition of ‘left’ was, I flat out asked her what she meant by that. She responded that the left believes that the land should be divided equally and Israel and Palestine should be two separate states and that what the Israelis are doing to the Palestinians is wrong. She then went on to state that she disagrees with the left and went on to tell us her political views. Coming from the land of the politically correct where discussing politics at work is a big no-no we found this whole discussion very interesting. We later learned that the Israelis will happily give you their opinion on anything, no matter what it is. No wonder why everyone carries guns there! The tour of the Old City was good and very educational. 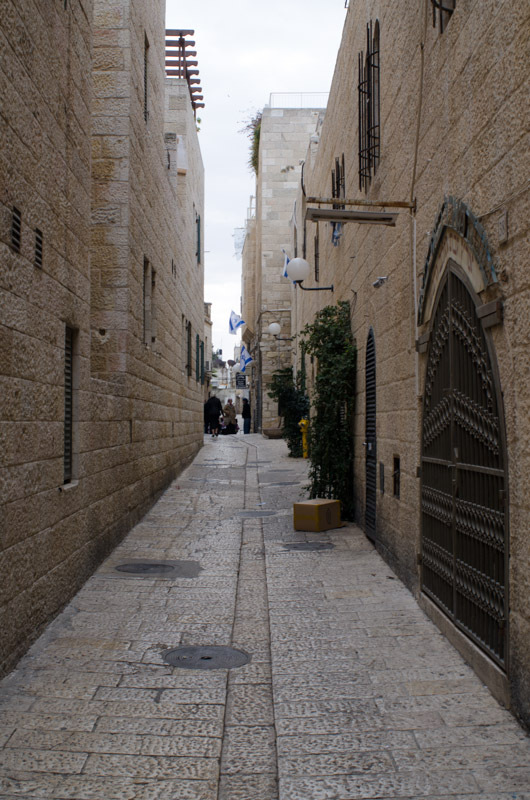 As we were touring the different quarters I was surprised at how new the Jewish Quarter looked. For a city 1000’s of years old I expected it to look a bit worn and weathered. As we entered the Muslim Quarter it definitely looked more lived in and not polished like the Jewish Quarter. We later learned that a lot of private individuals have donated money to rebuild and improve the Jewish Quarter. 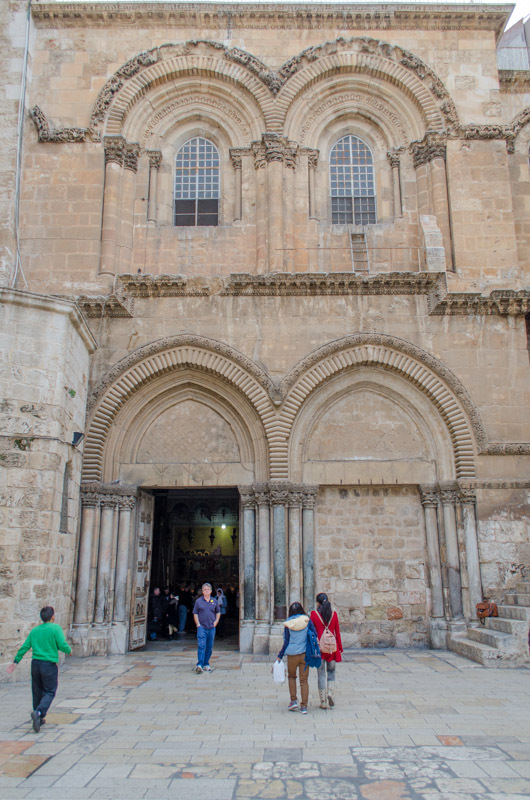 After the tour we visited the Church of the Holy Sepulchre where our guide mentioned fistfights amongst priests is common. The church is said to mark the spot where Jesus was crucified and buried and they have built the church over the alleged site. The church is considered one of the most holy sites for many Christians and is shared by several Christian churches. This has caused disagreements and has led to all out brawls. While it would have been interesting to watch two or more priests go at it, I’m glad my daughter did not have to witness such craziness. Inside the church the crowds were thick and pushy. 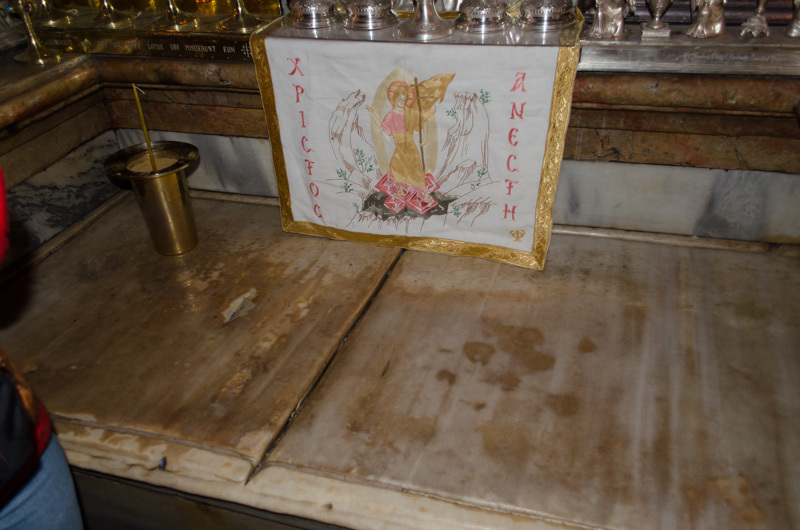 As you first enter there is a stone that was said to be the site where Jesus’ body was washed and prepared after his death. The devout believe that placing objects upon this stone makes them holy. 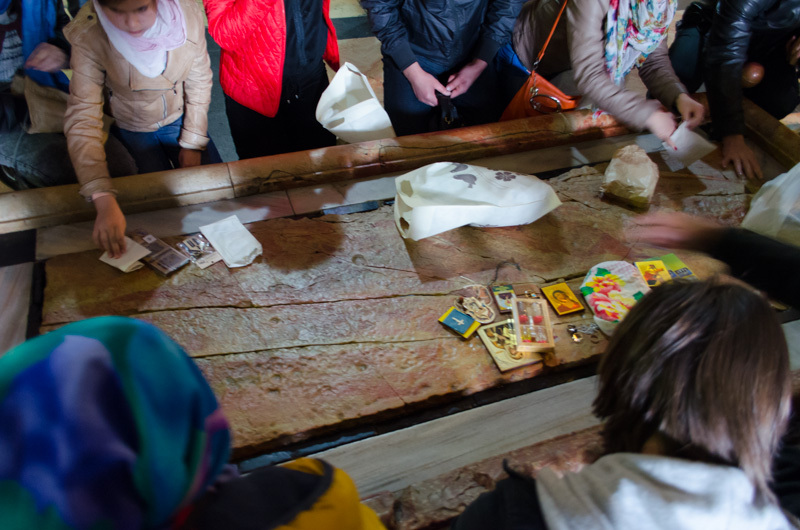 I witnessed people placing their iPads, cellphones, and other trinkets to make them holy. It seemed kind of silly, but I went ahead and placed my beloved camera on the stone. I can now say that I shoot with a holy camera! While waiting in single file line to go inside the alleged tomb, a group of tourists pushed past us and cut in line. Once inside people would refuse to leave and a priest stood by to kick people out. It was truly the craziest church I have ever been to! On one of the mornings during our stay in Jerusalem we decided to take a nice walk from our guesthouse to the famous Mount of Olives. 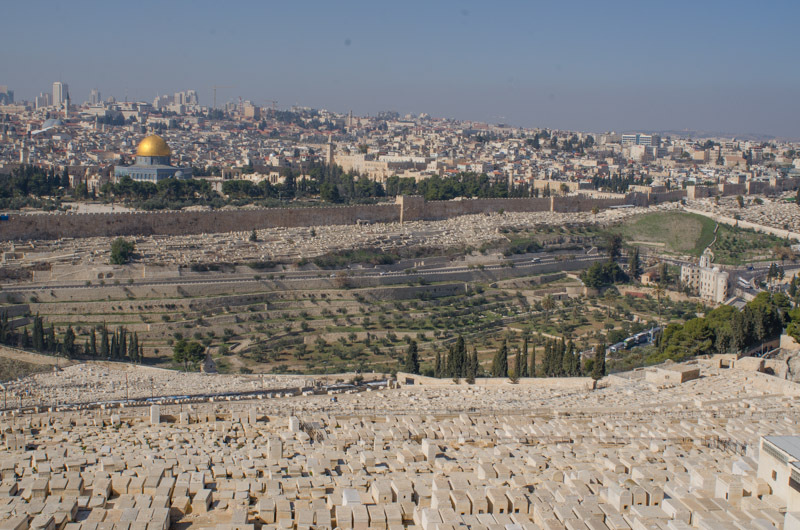 It is mentioned a lot in the bible, has a large Jewish cemetery, and has a phenomenal view of the Old City. As we walked towards the top of the hill we found ourselves in the middle of a Muslim neighborhood. The shopkeepers greeted us with smiles and a group of kids were waving and calling out, “Hello! What’s your names?” We smiled, waved back, and told them our names. They seemed excited to see us and we continued walking looking for a good overlook. Later that evening we were discussing this with a couple of girls at our guesthouse and they had said that they were also planning to walk up there that morning but were stopped by an old Jewish woman. She told them that they should not go up to the Mount of Olives because it is not safe for Jews. She said that children would throw rocks at them. They decided to listen to the warnings of the old lady and not go there. We later learned that the area we were in is known as East Jerusalem. Those same smiling kids that were waving at us would have been probably throwing rocks at us if we were Jewish. It’s hard to describe the tension in Jerusalem, but it is definitely palpable. Every mall, museum, and public site has airport style metal detectors and x-ray machines. Heavily armed soldiers and police patrol the city constantly and are everywhere you look. We witnessed Israeli soldiers drag two Muslim guys off a public bus for probably just being Muslim. But then again, we heard about Muslim kids throwing rocks at Jews, just because they are Jewish. The city felt completely safe for us, as tourists, but the people that live there seem to live under a constant threat. It’s not IF the next conflict will start, it’s WHEN will it start. It saddens me that so much tension and hatred can be found inside one of the holiest places on Earth. There’s the age-old question: why can’t we all just get along? 1. It seems like the van driver at Ben Gurion took the 443 road to Jerusalem instead of highway 1 – which is the major highway from Tal Aviv to Jerusalem and runs in the green line and has no barbed wires and soldiers anywhere – only greenery. Road 443 actually runs outside the green line and therefore all the security presence. It’s considered a more dangerous road since there were a few attacks of Palestinians on Israeli drivers there. Most Israelis only take highway 1 when the travel to Jerusalem. Why do the van drivers from Ben Gurion drive there? maybe less trafic. Many of these van drivers are Arab by the way. 2. 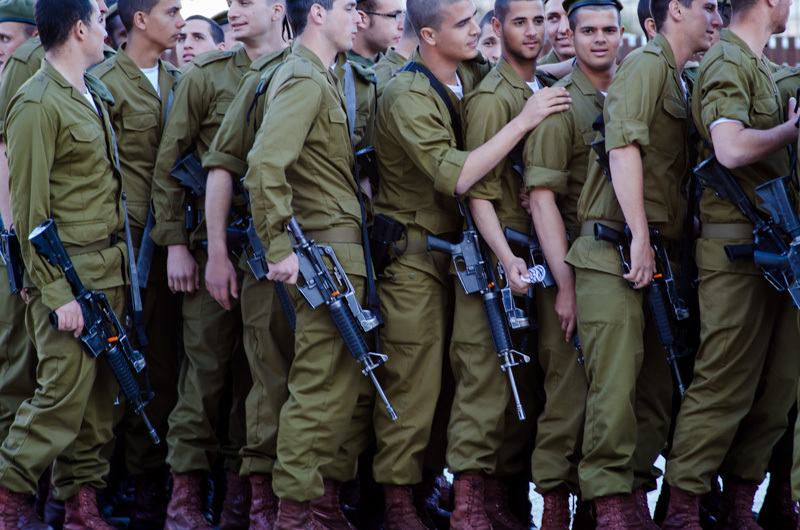 Soldiers in Israel who carry a gun (not all do!) must have it with them wherever they go – even if they are on vacation and are not even in uniform. They will be trialed if they don’t have their weapon with them always and everywhere they go. 3. There are all types of soldiers in Israel. Many of the guards in the old city are actually border police. Many of them by the way are not Jewish but Druze or Arab Beduins. But there ARE many Arab kids hanging around Jaffa gate and other parts of Jerusalem and many of them are looking for trouble. 4. Regarding the Jewish quarter. Oh dear, it seems like your guide didn’t do a very good job – and you are not very informed of the history of the place. In 1948 the Arabs in Palestine and their Arab brothers from 5 Arab state opened a war against the Jews in Palestine. The Arab rejected the 1947 UN partition plan which called for the division of Palestine to 2 states – a Jews one and an Arab one. Jerusalem according to this plan was to be an international enclave belonging to neither states. The Jews accepted this plan (apparently they were “left wing”) but the Arabs rejected it and opened a war against the Jews a few months later. During that war the Jordanian army captured the old city of Jerusalem (and the rest of east Jerusalem). It chased out all the Jews who lived in the Jewish quartered and burnt the quarter to the ground. What wasn’t burnt – like a few synagogues was turned into stables for the Jordanian army. 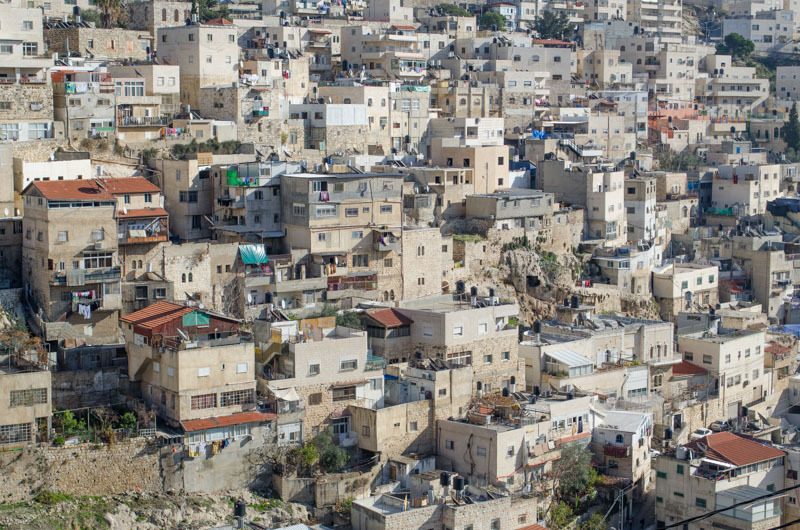 In the 1967 six days war Israel captured the old city of Jerusalem and rebuilt the Jewish quarter from its ruins. Many of the houses you see today were rebuilt after 1967, that’s why they look so “new”. 5. Regarding these lovely smiling Arabs near mount olive. Well I guess you should be glad that you are were not a sole female tourists or just Jewish. Unfortunately the experience of many Jerusalemite with the Arab population is not so positive as yours. For instance female students on mount scopus who are being harrassed and attacked on a daily basis by Arabs who live around there. Or Jewish families who have been stones and nearly lynched when they came to visit the thousand year old Jewish cemetary on mount olive or passed by other Arab areas in Jerusalem. 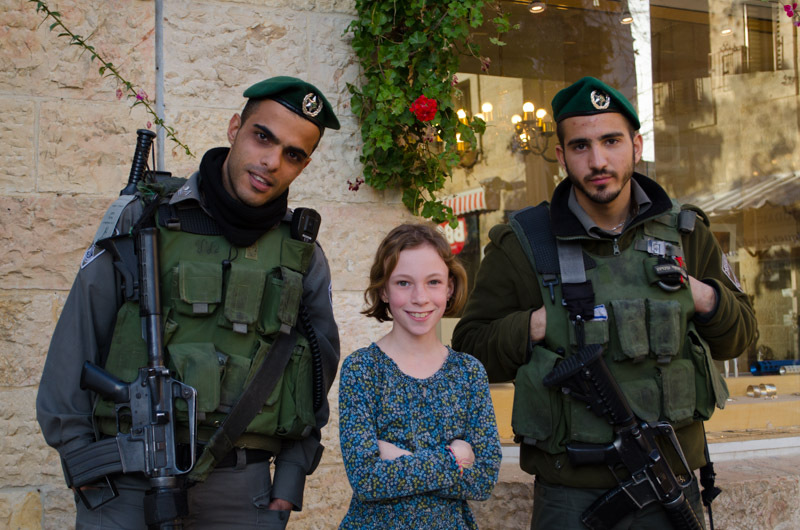 If you were still in Israel I’d suggest a simple experiment – let your daughter stroll around mount olive or other Arab neighborhoodsof east Jerusalem with a necklace of a star of David. Oh my god! Smiling faces and cheerful hellos will not be what she’d encounter. You know what? even without the star of David necklace. Many Arab and female tourists are also being harassed by Arabs in Jerusalem. Another thing is that may Arabs in Jerusalem treat the environment like sh”t and you see them walking all over flowers, littering the streets and on Thursday I saw an Arab man letting his 3 kids urinate in bushes right next to Mamilla and Jaffa gate. A few days ago an Arab young man was waiting in a bus stop near where I live. All of a sudden (after he threw the cigarette he smoked to the flowers and bushes near by) he jumped and hanged from the roof of the newly built bus stop almost breaking it. Why? I thought to myself. Why do they have to destroy everything? It makes your blood boil because the Jews have managed to make Israel and Jerusalem a green, clean and developed paces but many Arab are destroying and littering the city. 6. Regarding all the metal ditactors. In the 2000s there was the Palestinian intifada (uprising) and every other day a bus or coffee ahop or whatever blew up in Jerusalem. We Jews didn’t stop our lives because of that but we made sure the risk will be minimum by all these security measures. 7. It’s quite riddiculous to suggest that the 2 Arab guys who were taken of from the light rail were taken of BECAUSE they were Arabs. It’s ridicuouls because more Arabs than Jews used the light rail daily. It is FILLED with Arabs. What you might not know is that an Israeli female soldier was stabbed by an Arab man a few weeks after the light rail opened and that the cracks insome of light rail car windows are cracked because of stoes thrown by Arabs as the train passed through the Arab neighborhoods of Jerusalem. Actually the vast majority of violent crimes in Jerusalem committed by Arabs and most of the Jews in Jerusalem Israel dare not set foor in an Arab area of Jerusalem. It’s mostly religioius Jews who dare risk themselves by going into Arab areas. You want to hear something really sad. For thousands of years Jewish people, muslim people, and Christians have lived together in Jerusalem. Occasionally there would be a flare up… like a little crusade or a muslim invasion, but mostly they lived together in peace and their biggest threat was the Romans. But then Hitler came along. Then began a mass migration of Jewish people to Jerusalem, because of the way the were being treated in Europe. What accompanies every mass immigration? Tension. Just like when my irish ancestors came to the United States. They found themselves on the outside and not necessarily welcome. Hitler actually was very successful in spreading his fascist ideas to the Arab states, and even made some of their leaders “Honorary Arions” ( did I spell that wrong…it’s not a word I use much). They were a team in persecuting the Jews. The British Empire was scheduled to leave in 1948, and at that point President Truman pressed in the United Nations for the idea of an independent Jewish nation and won. Why? Because of the gas chambers, and camps in Germany sickened Americans and haunted them. The good we do in this world ripples onward and outward and so does the evil, for generations. Hitlers ghost still haunts the middle east, and the little rock throwers do not even understand they are the dupes of evil men. When I worked in corrections I visited the King County jail. The have big cell blocks, and rather than bars, they have plexi glass walls. At first the Sherrif had gangs separated into their own plexi glass cells. The problem was they could see each other and they spent their whole time making gang signs and threats to each other across the cell block. The were so violent, the Sherrif had to find another way. So, he mixed the gangs all together in the cells. Now the people who hate each other walk very quietly amoungst each other, not because they get along, but because there is no escaping your neighbor gang. Violence reduced significantly. Free people are many times more complicated that controlled convicts, but I believe the answer to the violence will be the day that Muslims, Jews and Christians all have to live on the same block, work in the same factory, and go to the same school. Until that day comes I applaud the soldiers of Isreal. I have seen enough photos of bombed busses with little back packs and melted crayons in the debri. The tension is everywhere. Though it is the holy city of the world you can still feel the tension there.